Are shoppers buying your brand? Brand budgets are shifting. In the age of our economic uncertainty, big brands are diverting old school advertising spend to instore spend, either as a price promotion, on instore collaterial, or cleverly over investing in product packaging development. Aisles are filled now with so much point of sale merchandising that brands are having to scream louder than ever at the shopper at the critical decision making time – and will it be your brand’s product that makes it into the shopping trolley? The “last three feet” of the purchase decision process has just got more competitive. The retail store has become the most critical new advertising medium. So is your brand getting noticed in store? Speaking from experience (after launching product after product for Gillette, Revlon, Alberto Culver, amongst others) here’s the problem. Many new products simply lose their way when they reach the dizzy heights of being brought by the buyer of a national store. In some categories new products simply are invisible, because shoppers are so intrenched in their buying behaviour, they simple do not consider new market entrants as the purchase decision for these items is made long before entering the store. Have a think about it – when you shop for ketchup, do you buy the same brand, or same own label brand time after time? If a new brand of ketchup hit the shelf, would you notice? All new products are tested with consumers, in a huge manner of ways, before they are launched into the marketplace. BUT, so many new products are tested prior to launch without the competitor context, or against other new market entrants, launching at the same range review. Brand Managers, how often have you tested new products, and the results were outstanding in test marketing (mainly isolating conditions), but then the product disasterously failed to break through the noise and clutter when placed in the real-world, on a real shelf, in a real store, with real shoppers! Most products, when you are working on them, look amazing. Well at least they do to you. All the packaging will be on equity, the branding will pop out, the colours will be those from the brand guidelines, the layout will match that of the brand packaging hierarch. You are delighted. Then, you do a store check and see your new product in the supermarket or store for the first time. And that’s the real test. Are you still delighted? Are shoppers noticing your product? Does the EPOS match your BASES prediction? Is your product stealing share from your competitors or is it another product that will make its gloomy journey out of the line up via the bottom shelf? 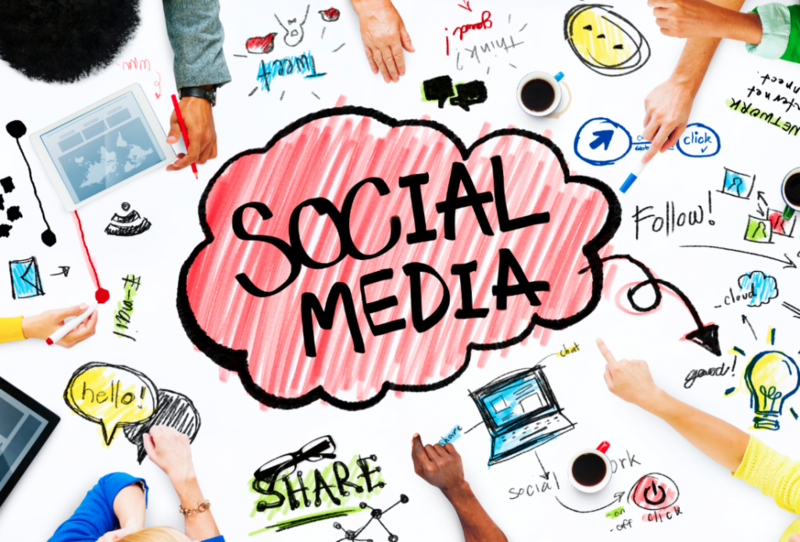 Capturing attention, and luring new shoppers to your brand is simply not easy. You could read 100 text books, prepare the most fantastic marketing strategy plans, have the smartest teaser campaigns, huge media budget, great trade buy-in and huge pipefill orders. But in the current market place, no matter how powerful your brand, how compelling your product promise is, the most important part of your marketing is to ensure you create packaging that has strong visual shelf impact, both in the use of design and colour, but also in the structural aspect. Whilst at Procter and Gamble, I had to run all my new products through Eye Tracking, to see what shoppers actually see, and what they miss when shopping. And shoppers miss at least 1/3 of all of the products on the shelf. The most noticeable products are those on the shelf at eye level. If your product has slipped down on a shelf below waist height it will be harder for shoppers to even consider it. Have a look when you are next in store, very few shoppers bother to crouch down and have a jolly good look at the small boxes of skincare creams on the bottom shelf. Nor will they get on tip toes and check out the razor blades on the top shelf. Top or bottom shelves are simply less visible to shoppers, which contributes to their declining in sales potential. Placement on these shelves is one step nearer to being delisted. When you are next in store do this little exercise. Go and shop in an area you know well, let’s say the hair care section. Stand still and see what happens. If you are a typical shopper you will visually scan the shelf at between shoulder and eye level. And then naturally you will gravitate toward the right. If nothing appealing is located there, then you will look to the left of centre. Therefore, always negotiate placement of your products on a planogram to the adjacent right to the brand leader. This will certainly help your chances of success. A busy Mum (for arguments sake!) has less than 10 seconds to be persuaded at the shelf to pick up a product and place it in her shopping basket. All brand managers live and breath a new product’s features, benefits, equity pyramids and so on. But does the shopper, in such a passing hurry, understand a product’s unique point of difference? Does the product grab the shoppers attention at shelf? And does the shopper get the product’s DNA? Both of these need to occur, otherwise the alternative will be an automatic default to the usual product purchase. 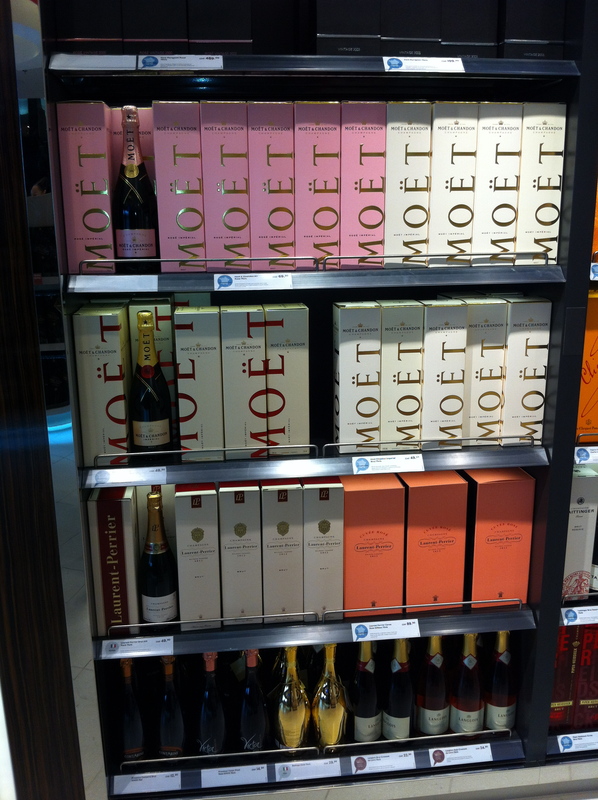 The best example I can share with you for powerful shelf blocking, that pops out from the shelf, screams “prestiege”, and makes you want to immediately buy, is from Moet. Just wanted to clock in! All fine here at the Marketing and PR Clinic, just been a busy few months.. sorry I have not been regularly blogging. I have been spending my time with a wide range of businesses, mainly in Devon, from commercial agents, new product developers, charities, beauty brands, schools, and health and fitness businesses. A similar theme amongst clients at the moment seems to be emerging. 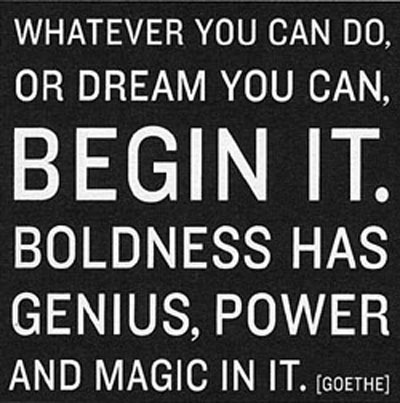 I am noticing an increased willingness to be bold and take risks with new product extensions, partnerships or simply in looking at new ways of doing business. Often it is the marketing department that pushes decision makers into trying all things news, and now visionary thinking and willingness to take risks appears to becoming wider spread amongst businesses. I am sure this is not just me noticing this shift, and I would really like to hear from others on whether they too are seeing businesses taking a more positive approach to taking risks, and decision makers beginning to enjoy being more bold in their marketing, to ensure their competitive advantage. Is this the beginning of the end of austerity marketing? It is not often that you have a day that you know you will truly remember. 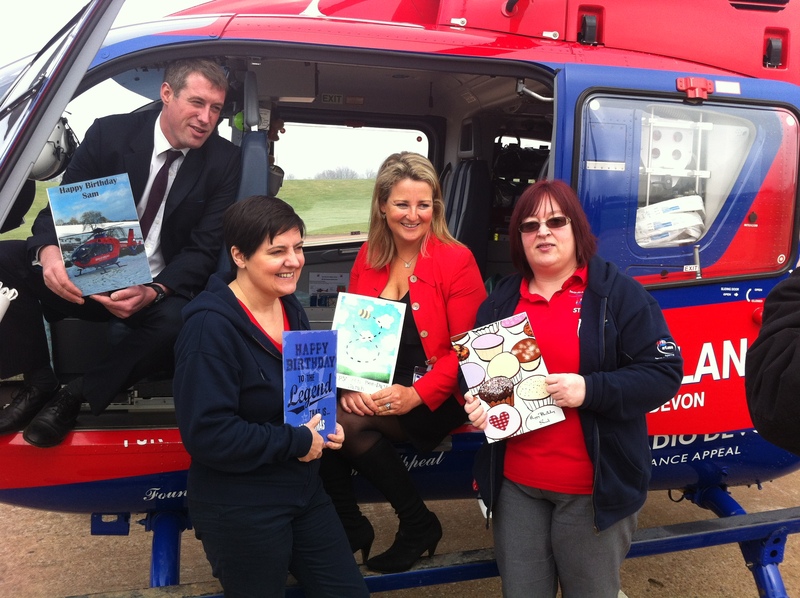 I was fortunate enough to have one such day today – the PR launch of the collaboration between Devon Air Ambulance and White Label Greeting Cards. 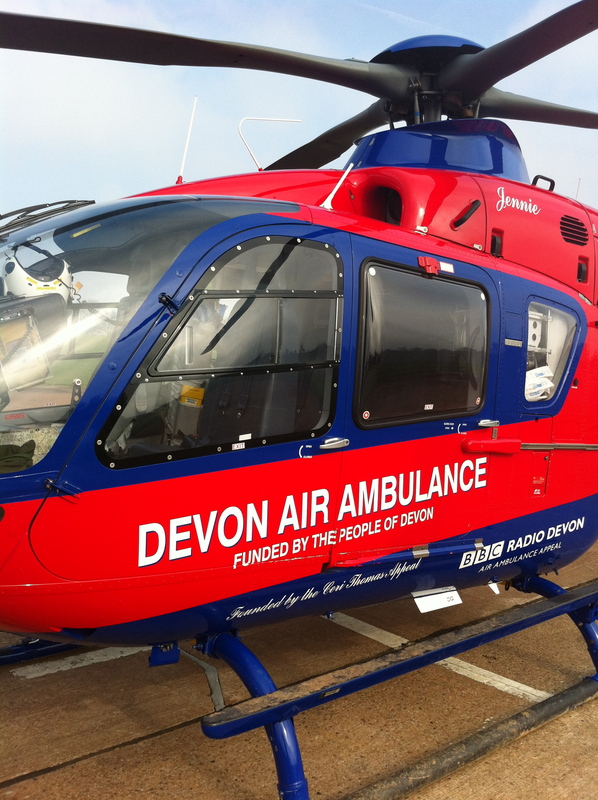 Devon Air Ambulance is the first charity to launch the new online personalised greeting card service, provided by White Label Greeting Cards. To celebrate Sam Heaton (MD of White Label Greeting Cards), Jack Lomas (Devon Air Ambulance Trustee) and I were invited to be shown around Devon’s Air Ambulance – a EC135 Helicopter – based at the Devon & Cornwall Constabulary Air Support Unit at Middlemoor in Exeter, by Helena Holt (CEO Devon Air Ambulance) and Sarah Burden (PR Manager Devon Air Ambulance). On arrival to the air base, the red glistening helicopter was a wonderful sight, parked up, in the clearing fog. Paramedic Helen comprehensively explained exactly what happens when an emergency call is put out, how the equipment is efficiently stowed, and how cleverly treatment is carried out onboard. The air ambulance is used extensively everyday in Devon for emergency medical assistance in situations, where either a traditional ambulances cannot reach the accident scene easily or quickly enough, or where the patient needs to be transported some considerable distance. The team at White Label Greeting Cards is extremely proud of the collaboration, and look forward to it turning into a successful fundraising initiative for this essential live-saving Devon charity. Define clearly what you do.. It has been a busy few weeks for The Marketing and PR Clinic. Working with new businesses over the last month in the South West, the overriding and most fundamental piece of advice is to really clearly define and communicate what you do and what you’re offering. Whether you are a hat designer, a headmaster, or a hotelier, you’ll be pleasantly surprised how many potential clients are lurking!